Story: Malcolm is a high school geek with a high-top fade, carefully navigating life in The Bottoms, one of the toughest neighborhoods in Inglewood, California. He and his fellow outcasts share a voracious appreciation for all things ’90s hip-hop, opting to sport Cross-Colours and Z. Cavariccis at the risk of being clowned at school. He dreams of attending Harvard, but first he has to make it home every day. When a drug dealer takes a shine to Malcolm and invites him to his birthday party, Malcolm’s crew is swirled into a hilarious blender of offbeat characters and bad choices where redemption can only be found in Bitcoin. Source: Sundance.org. The Hollywood Reporter: It’s not every film that can turn the concept of a slippery slope into a repeatedly used and hilarious punch line, and [Rick] Famuyiwa’s dialogues are often not only funny but also sharp and smart. A notable exception is the way race plays a role in two scenes, the first a discussion of why white people can’t use the N-word — which the black characters here use more often than articles and verbs — which is so drawn out (terminating in a weak and literal punch line) that it starts to feel like sermonizing, while the second is the way race factors in to Malcolm’s Harvard application essay, which is certainly truthful but lacks any kind of argument around it that would demonstrate his innate intelligence. The decision to also make the protags play in their own music group feels a little too much like a movie conceit and their songs, written by Pharrell Williams, will no doubt help market the film but don’t feel like they could’ve been written by these three kids, however brainy. That said, the film’s overall energy, and performances are spunky enough to almost always temporarily suspend disbelief when required. See the full review at hollywoodreporter.com. /Film: The film has a lot to say about growing up black in a bad neighborhood with bigger dreams than can be afforded. It’s about subverting expectations and staying true to yourself in the most impossible no win situation. The film provides an interesting portrait of “The Bottoms” area of Inglewood California, filled with gangsters and drug dealers. Dope is much deeper than its pop culture throwback shell, featuring high school characters with complexity and authenticity. While the story is linear for the most part, the screenplay offers us a few flashbacks which sometimes further connect the characters and stories like a well constructed puzzle. Dope is charming and poignant — an incredibly relatable urban dramedy that works on almost every level. See the full review at slashfilm.com. Mashable: Dope is exactly what the title says it is. Funky fresh, funny, complex and uncompromising, Dope — which made its world premiere at the Sundance Film Festival — is going to be one of those Sundance movies that, if it finds a good home, will be watched, rewatched, quoted, referenced and beloved for years to come. Existing somewhere between Juice, Ferris Bueller’s Day Off and Spring Breakers, get ready for three main characters to unapologetically root for through a series of outlandish twists and turns that are somehow utterly plausible. 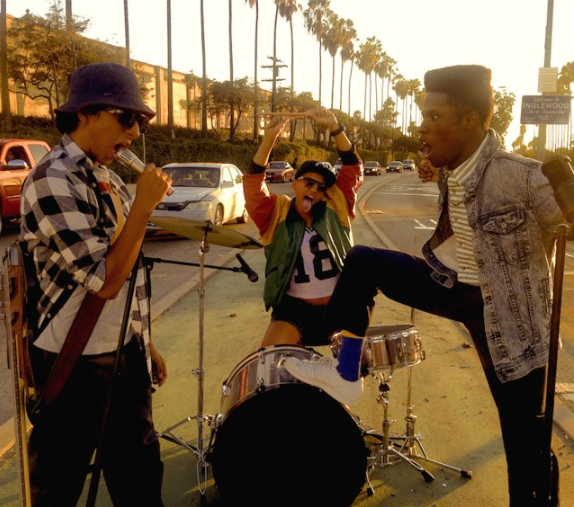 With a mid ’90s hip-hop color palette and soundtrack to match, Dope is a wild bike ride through the streets of Inglewood, California, seen mostly through the eyes of high school senior Malcolm that bombards the screen with vivid characters and crazy choices. See the full review at mashable.com.